During the summer months, many of my steelheading brothers are out on Lake Erie chasing walleye, perch and smallies. Due to the fact that I don't a boat and I easily get seasick, I’m forced to fish the local rivers to keep me occupied until the steelhead return in the fall. Many of those friends that fish the big lake often dismiss stream fishing as unproductive. They feel that river fish are often too small and the lack of desirable species makes it hardly worth it. They can waste a shitload of gas as they head out nearly 20 miles to chase after a couple of fish. One fish that is found in large numbers during the summer months in the local rivers is the common carp. Growing up in Northern Ontario, I never saw a carp. Only until I went to college in Southern Ontario did I encounter them. My first impression was of being awestruck by the massive size of them. Looking like a goldfish on steroids, I would watch 40 pounders feeding along the breakwalls in Lake Ontario. From what I gathered anglers either loved them or hated them. The diehard carpers respected them as a wily adversary and claimed that they were smartest freshwater fish alive. The others regarded them as nothing more then trash fish that should be exterminated. Only until I moved to Ohio, did I start fishing for carp. 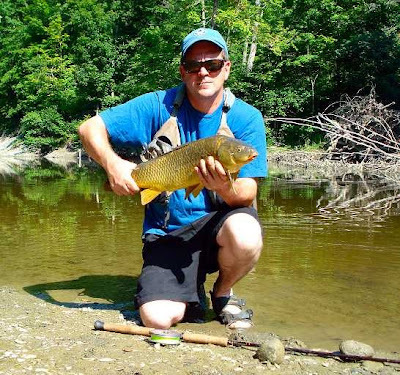 My favorite spots to fish were sections of the river that have a slow to moderate flow with a depth of 2’ to 3’ deep. Many of these spots are some my favorite steelhead haunts in the winter. In the Rocky, carp could be found throughout the river. But, they usually prefer to hang out in the deeper pools. Due the high algae and silt in the streams during the summer, the water is usually runs slightly stain even when the water is low. With polarized sunglasses, the fish can be spotted easily in the shallows. In deeper water, I look for mud plumes. Mud plumes are the result of carp sucking up the bottom looking for food. In some pools plumes are very evident due to many carp feeding at the same time. The day before fishing, I’ll make up a batch of chum. My chum recipe is pretty simple - cornmeal, crunchy peanut butter and vanilla. I add the ingredients into a bowl and mix it. Then I’ll put the chum into a zip-loc bag and place it in the fridge to harden. I’ll find a selected pool to fish and take a handful of chum and toss it into the current. The oils in the peanut butter and the vanilla provide the scent that gets carp into a feeding mood. For bait, I like to use sweet corn or pinto beans. Usually carp have a hankering for corn and rarely turn it down. Carp found in the Rocky River are usually smaller than the lake dwelling behemoths that I see at the power plant. They range from 2 to 10 pounds and can be easily caught on light tackle. For river carp, I use my steelhead float rod and centerpin. The long rod is very effective as it allows better float manipulation and the use of lighter lines. One of my favorite floats is the Drennan 5X4 Avon with the wire stem. I use a 6’ 10 pound leader and for the tippet it depends on what type of water I’m fishing. If I’m fishing a pool with little lumber, I’ll use a 6 pound tippet. If I’m fishing near a lot of lumber, I’ll use an 8 pound tippet. For both situations, I like to use an abrasion resistant limp tippet. Most of the spots I fish have a very slow current, therefore I don’t use split shots. If I’m fishing still water, then I’ll use a single large split shot to keep the bait at the bottom. Since the float has a wire stem, it will balance on its own. The weight of the hook is enough to get the bait down. For hooks, I like to use the ones for spawn sacs. I also like to have my hooks the same size as the kernels, so the #10 hooks are my favorite. Once the fish have begun feeding, I’ll cast out and let the float move downstream. Carp are notorious for spitting the hook before the angler gets a chance to set the hook. The reason is the fish detect the line against their lips. To get around that, I employ using a hair rig. Hair rigs are extremely effective as the bait is the first thing that enters a carp’s mouth. Once the fish detects the hook in its mouth, it will blow it out. Since the sharp end of the hook is facing outward, the fish will end up hooking itself. For my hair rigs, I use dacron as it’s very limp and strong. The first thing, I do is tie a loop. The loop is where the bait is placed. To hold it on the hook, I’ll thread the line through the eye of the hook. Then I’ll wrap it around the entire length of the shank. I’ll then cut a piece of silicon tubing and slide it on the hook. This will hold the line in place. For bait, I’ll use a couple kernels of corn or single pinto bean. I’ll use a metal sewing hook to thread the loop through the bait. Then I’ll use a small piece of a leaf’s stem and stick through the loop. This will prevent the bait from sliding off. As the float drifts, I look for any movement. In still water, the float will usually pop up. This is the result of the fish lifting the sinker off the bottom. When the float is drifting, I look for any movement. Most of the time it will go down hard, as the fish panics when hooking itself. Unlike the acrobatic feats of a steelhead, carp are all brute strength. They may look obese and lazily swim about, but they can unleash a charge that would make a bonefish proud. I’ve had some large carp rip off almost a 100’ of line with little effort. When fishing near lumber, the largest carp will always head for it. Whenever, I set the hook I’ll immediately try to confuse the fish. Sometimes it works and sometimes it doesn’t. Once they finished with initial run, they are relatively easy to land. I find carp are a worthy adversary and I give them a great deal of respect. They are challenge to fish for regardless of what method is used. Carp have saved me from a long summer of boredom and I always find them a thrill to fish for.